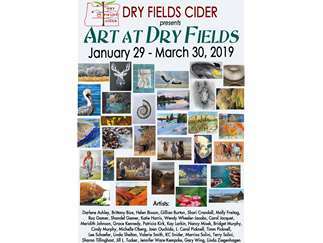 DRY FIELDS CIDER is pleased to announce our newest ART AT DRY FIELDS Exhibition opening January 29th and continuing through March 30, 2019. Come on down to 611 NE Jackpine Ct. #3, Redmond, and enjoy sampling one of our 22 rotating ciders, beers and kombucha and view artwork by 33 of Central Oregon’s finest artists. Owner, Stephen Fields, a native of Redmond, has been producing cider for the past two years. He believes that DRY FIELDS CIDER will be the go-to place for dedicated ­cider drinkers, and a companionable place for Redmond residents to meet and enjoy a refreshing drink together. DRY FIELDS CIDER is located in a beautiful new industrial complex which also houses PORTER BREWING, CO. and features the BAD BOY’S BBQ truck. PORTER BREWING, CO. offers a little something different as a brewery. Family owned, PORTER’S serves only cask ales. The BAD BOY’S BBQ truck serves BBQ pork, tri-tip and more. They are also known for their catering services. Whether you’re sampling a new cider or enjoying an old favorite, take a moment to view some of the amazing artwork covering DRY FIELDS CIDER’S walls. DRY FIELDS CIDER is open Tuesday through Saturday 12:00 PM – 9:00 PM. For more information about the art exhibition, contact artinfo@bendbroadband.com.